In my previous post I have explained how Database Mirroring and Service Broker use certificates for endpoint authentication. The only thing validated by SSB/DBM on a certificate are the valid-from date and the expiration date. In fact, even if SSB would not validate these dates, the TLS protocol used underneath by SSB/DBM authentication mechanism would validate these dates. In practice the only one that matter is the expiration date since the valid-from date is usually valid from the moment the certificate was created. Although if you follow this blog you know that I have already talked about a problem that may appear with certificates not yet valid, see http://rusanu.com/2008/08/25/certificate-not-yet-valid. If you have in care servers that use Certificate based Authentication for Database Mirroring or Service Broker endpoints you must be prepared to replace the certificates used when they expire. Neither DBM nor SSB will not interrupt an existing connection when the certificate used to authenticate expires, but when a new connection is attempted the expired certificate will prevent it from being established resulting and some difficult to diagnose and troubleshoot errors. Luckily the certificates about to expire ca be identified and replaced before they expire, with minimal impact on a production server. 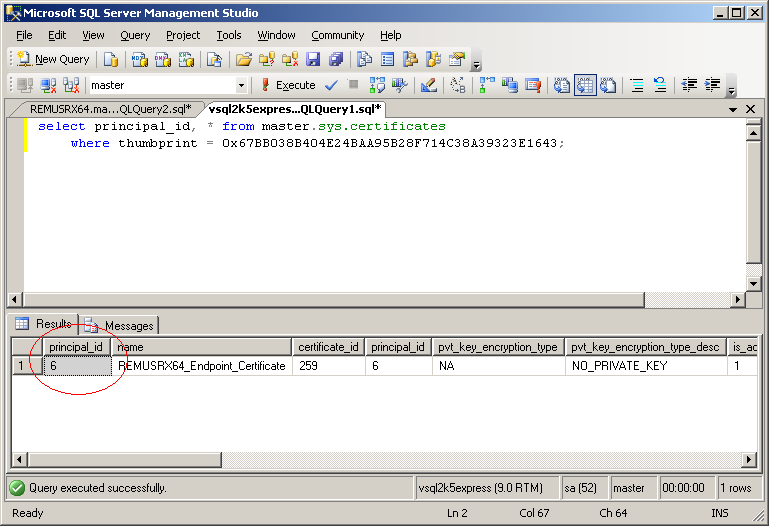 The authentication used by the endpoint is described in the connection_auth_desc column. If it says CERTIFICATE then the endpoint is using certificates for authentication and you must next check the expiration date of the certificate used. To find out just which one is this certificate, check the certificate_id column and then check the sys.certificates metadata catalog to see if the certificate used by the endpoint is about to expire. The expiry_date column will show the certificate expiration date. If the expiration date is near then you need to prepare the certificate replacement. Backup the newly created certificate. Copy the certificate to all the peer servers. 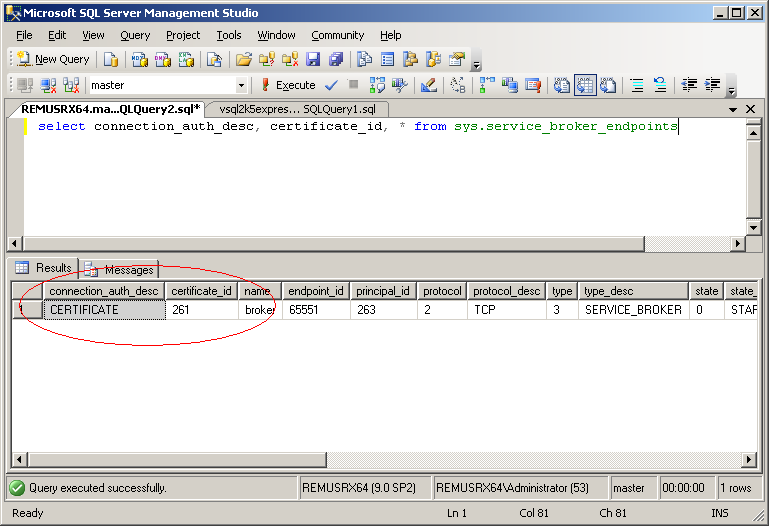 Restore the certificate on each peer server in master database, under the same ownership as the old certificate. Alter the endpoint to use the new certificate. Drop the old certificate on each peer. Drop the old certificate on the server hosting the endpoint being updated. Because the certificates are deployed (exchanged) prior to changing endpoint’s certificate, this procedure ensures that the communication is only stopped for a very short brief during the ALTER statement at step 5. And since we’re deploying the certificates on the peer servers using the same owner as the previously used certificate, there is no need to create a new login and to grant CONNECT permission, the old login is reused and it’s existing permissions are just fine. 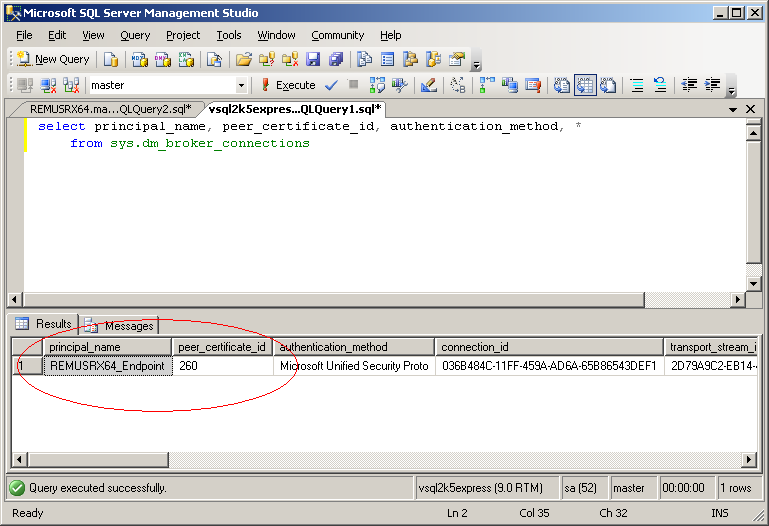 I have two SQL Server instances that are exchanging Service Broker messages using certificate based authentication endpoints. The two SQL instances are default instances on the machines REMUSRX64 and VSQL2K5EXPRESS. I’m going to verify if any of the certificates are near expiration and replace any certificate about to expire. Because I used the same ownership (authorization clause) on VSQL2K5EXPRESS as the old certificate used for authentication I do not need to create a login and grant CONNECT permission. The new certificate will authenticate the same login as the old one and thus benefit from the existing permissions. 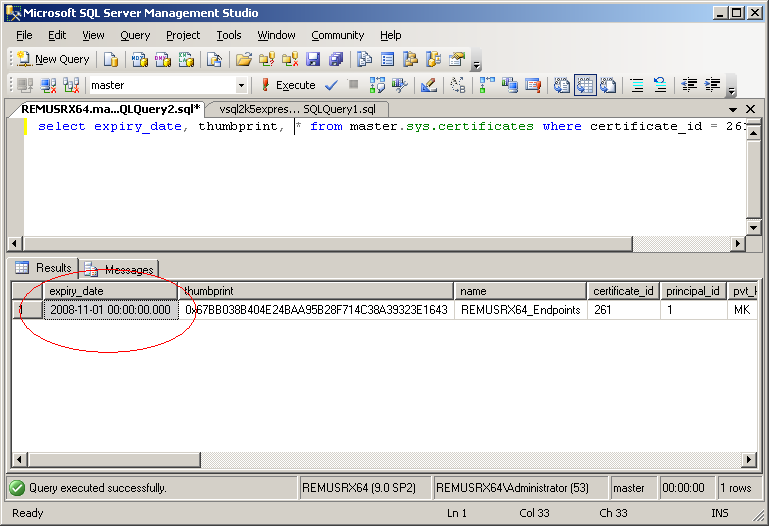 The peer REMUSRX64 was authenticated to the principal name REMUSRX64_Endpoint based on the certificate with id 260. You can verify that this is the new certificate. If you’re curious what does the authentication method Microsoft Unified Security Proto mean, it is the name of the SChannel SSPI provider which was used for authentication. With the switch effective the last thing is to clean up the old certificate. It is now safe to DROP the old certificate both on REMUSRX64 and on VSQL2K5EXPRESS as this certificate is no longer used for Service Broker endpoint authentication. I’m not going to show how to do this, is straightforward. In case of Database Mirroring endpoints using certificates for authentication the procedure described above is almost identical, the only difference is that you are going to have to look at the sys.database_mirroring_endpoints metadata catalog instead of sys.service_broker_endpoints. Also note that if you have a witness in your deployment, then my earlier remark about deploying to all peers before altering the endpoint to switch to the new certificate applies to you, since the endpoint has at least two peers. Also because Database Mirroring endpoints tend to be created together as part of mirroring session deployment, the certificates used tend to have near expiration dates. This procedure showed how to replace the certificate used by one endpoint and is is very likely that you will need to repeat the procedure on all the instances involved in a mirroring session: principal, mirror, witness.